Tasting mildly like chocolate, teff flour has plenty of natural sweetness and blends well with nuts and chocolate. 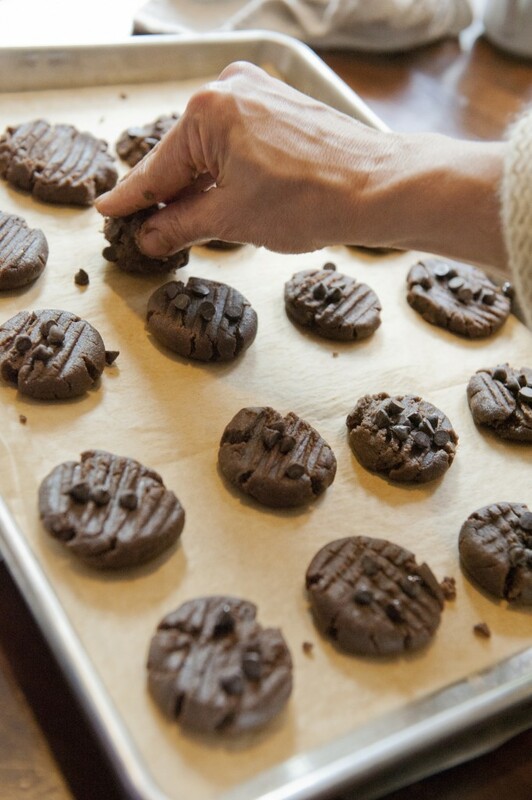 These cookies, a classic combination of peanut butter and chocolate, are delightful treats. In a large mixing bowl, combine the teff flour and salt, if using. Set aside. Place the peanut butter, maple syrup, oil, and vanilla in a food processor, and blend until creamy. Add to the flour along with the chocolate chips, and stir to form a moist dough. Shape the dough into walnut-sized balls, and place them on an ungreased cookie sheet about 3/4-inch apart. Flatten gently with a fork. Square One Publlshers, Inc.© 2005. Used by permission of the publisher. *This post contains affiliate links. If the product is purchased by linking through this review, Leslie Cerier, The Organic Gourmet receives a modest commission, which helps maintain our site and helps it to continue growing! This entry was posted in Desserts, Gluten-Free, Recipes, Vegan and tagged Gluten-Free Cookies, leslie cerier, Organic, Peanut Butter Cookies, Vegan Cookies, vegan recipe on 12/19/2011 by Leslie Cerier. Thanks the ingredients are posted now!